This is a dog day cicada, not the periodic cicada we hear about that emerges only every 12, 17, or some large number of years. I found it hanging out on my back door this morning. The begin to call in late July and then continue on until September. The usually hide out in the tops if trees so it is fun to see one up close. The are part of the order Hemiptera which means half-wing. You can clearly see that the wings do not cover the entire back, they leave a triangular patch exposed. This is an easy characteristic to look for on Hemiptera. This one was about two inches long. Their call is over 100 decibels which always impresses me. Keep your eyes open for cicadas. They are fascinating. Yes, it's that time of year again. 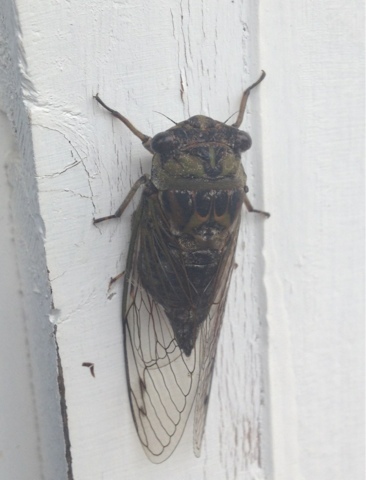 Coincidentally, I share some thoughts on cicadas & the season at One Man's Wonder this week.